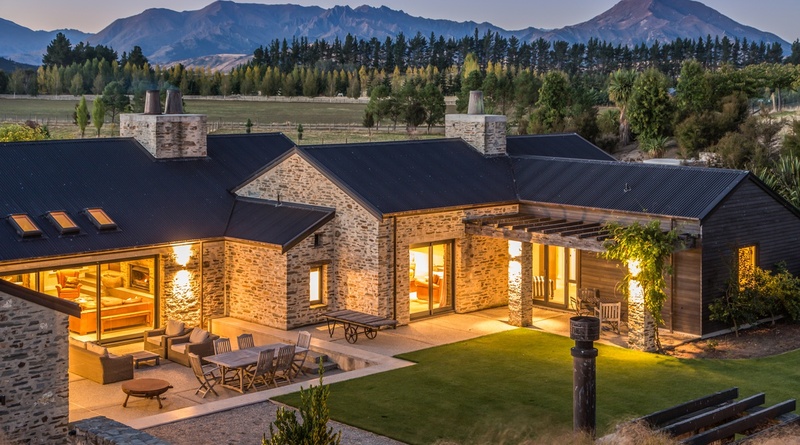 Just eight minutes from Wanaka, Kōhatu is built with materials of the highest quality featuring wooden doors and beams. Huge windows make the most of the surrounding mountain views. The use of Central Otago stone provides a rustic yet beautiful modern design. ‘Kōhatu’ aptly translates to precious stone or rock. Sleeping up to 14 guests, it is fabulous for a group or for families travelling together. Numerous living areas, a cook’s dream kitchen, dining area and three fireplaces ensure comfort and ease in your home away from home. We picture you sitting around the fire with friends after a day of activities, delicious local pinot noir in hand, kids still outside in the pool or tennis court, while a private chef prepares delicious canapes and dinner. Kōhatu will tempt you not to leave the grounds! You’ll be well entertained with a heated swimming pool, spa pool, an underground theatre, petanque pit, surround sound music systems, in-ground trampoline and an outdoor pizza oven. We know this new villa will delight adults and children alike!